Logitech Pure-Fi Express review | What Hi-Fi? 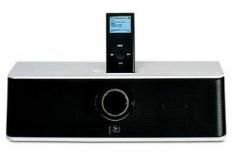 The Pure-Fi Express joins Logitech's range of speaker systems that complement the ubiquitous iPod. This product includes a protective case, and the dock runs on batteries, as well as mains, so is clearly geared at those wishing to share their little Apple portable's tunes wherever they go. However, unlike its slightly smaller Pure-Fi Anywhere sibling, the Express doesn't come with an internal battery-charging system. Instead, it runs on six AA cells, which give up to 10 hours play. This situation isn't a major problem, but it does mean its family rival nudges ahead a couple of steps in the portability stakes. Where the Pure-Fi Express makes more of name for itself is in one area that does count for plenty: the sound department. This unit's added bulk over the helps it deliver greater bass reach than its smaller sibling. Now we're not talking about ground-shaking lower stuff – for that you need something bigger: say, Acoustic Energy's complete-with-subwoofer Aego M-System. However, you can at least detect some of the lower depths to Massive Attack's unearthly rumblings during Karmacoma. The Bristol band does, however, swiftly expose most docks of this relatively compact size: hook up your iPod, select Protection, twist the dial north, and the little speakers take fright, leaving you with a somewhat confused and distorted sound. Stick to less frequency-pushing tunes, though, and this unit is fine. Give it just a little shelf space, and it'll happily deliver a well-balanced sonic background to your chopping in the kitchen, lazing in the bedroom, or soaking in the bathroom. So despite criticism, this unit still earns a very fine five-star verdict. For £50, it's not fair to expect a life-changing audio experience.